By VivekTitle: Curry: fragrant dishes from India, Thailand, Malaysia and Indonesia. Learn how to make fragrant dishes from 18 regions including India, Thailand, Vietnam and Indonesia. Discover what ingredients make each dish special with step-by-step techniques that make each recipe clear. Acceptable - Very well read. Reading copy only. May have significant wear and tear and contain notes & highlighting. CONDITION: Good. Good - Usual signs of a well read book but good overall condition. Authors: Singh, Vivek. We hope you enjoy your book and that it arrives quickly and is as expected. Edition: 01. The picture may not reflect the books condition or specific edition. Authors : Singh, Vivek. 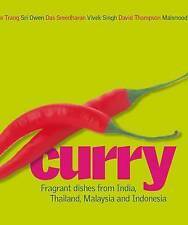 Title : Curry: Fragrant Dishes from India, Thailand, Malaysia and Indonesia. Dust Jacket : False. Pages : 352.